The Spirit Program here at Vanderbilt prides itself on its involvement with all who encompass the Commodore Family. Our focus remains to promote Vanderbilt University Athletics through various appearances throughout Nashville and the state of Tennessee. 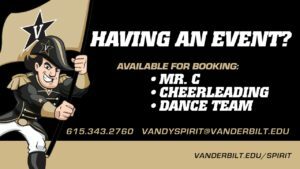 Do you wish to have our Vanderbilt Cheerleaders, Dance Team, or Mr. C attend your event? If so, view the pricing information below. Note that appearances are limited to one hour and mileage will be added to the pricing for any event more than 25 miles from campus. 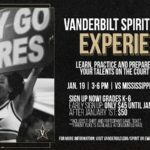 For general questions, or to schedule an appearance, please fill out an appearance request form or call 615.343.2760 or email vandyspirit@vanderbilt.edu.